My first reaction to hearing today about the European court ruling on honey containing products from GMOs (Genetically Modified Organisms) was one of exasperation! I had been listening to on the BBC's Food Program on honey. However, when I actually dug deeper and read both the final ruling of the 6th September 2011(available in English here) and the thankfully clearer summary in an earlier Press Release (available in English here), I found myself agreeing with the sentiments of the well reasoned judgement. You cannot put honey on the market if it contains “Products of GMOs” which have not been authorised for use in honey. Several Bavarian beekeepers had found that their honey contained DNA and trace amounts of GM protein from Monsanto Maize variety, MON-810, growing on an experimental plot 500m away from the hives. The maize variety was one of two authorised to be grown and used for animal feed in the EU under the “Deliberate Release” Directive 2001/18 and also in producing products from GMOs, namely maize flour, maize gluten, maize meal, maize starch, maize glucose and maize oil. Note that some EU countries have unilaterally banned its use. The court considered how honey was produced and defined. The inclusion of trace amounts of pollen in extracted honey is part of the process – indeed, pollen grains can be used to test the origin and provenance of individual honeys. By current definitions, Pollen from a genetically modified plant is a GMO if it can still fertilise another plant. Now, by the time pollen has ended up in honey, it is no longer capable of fertilising another plant and legally ceases to be a GMO. However, the inactive pollen and the nectar from a GMO plant that have been turned into honey by busy bees are deemed by the court as “Products of GMOs”. 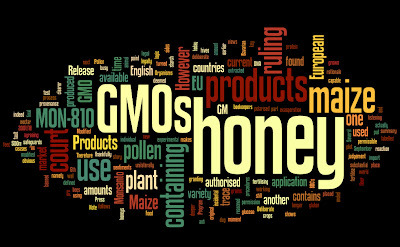 In the original application and granting of permission for use of Maize MON-810, honey was not included as one of the permissible uses for “Products of GMOs”. Therefore the honey containing products from Maize MON-810 cannot be placed on the market at this moment in time. I cannot fault the logic. Is this the end of the world for honey (we import a substantial amount from countries using GM crops) or for the use of GMOs? No. For Monsanto, the obvious next step would be to add a new application for deliberate release which includes the use of MON-810 products in honey, even if this is incidental. Any honey then produced which contains these products would be labelled as containing GMOs. The use of GMOs for food is controversial in the EU, with views polarised on both the pro and anti sides. However, the current European court ruling on honey containing products from GMOs shows that legal safeguards and procedures are in place – and working. The author, Dr Chris Thomas, had over 20yrs experience working in the GM plant industry before setting up his own, totally unrelated company in 2004.